Here’s what she did….don’t you love it? I do! I think I’m even more excited than the first time this novel came out! Getting ready for re-release has been a revelation, to say the least. Not only did I still love the story and the characters (picture a young Tom Selleck crossed with Sam Elliot as Austin....oh my! ), but choosing the pictures for the cover was a lot of fun (if a little overwhelming). So much to choose from! So here’s a little snippet of what Angel in the Moonlight is about…..
Callie Maxwell wants nothing more than to find the men responsible for the violence committed against her family and bring them to justice. She isn’t about to let Austin Kincaide, the by-the-book U.S. Marshal sent to solve the murders, stop her. Nor can she stop herself from falling in love with him even as she defies his orders not to interfere with his investigation. 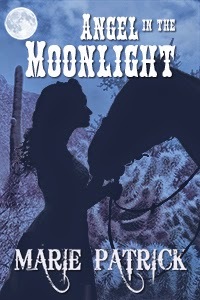 As the Angel of Justice, Callie’s alter-ego, she rides in the moonlight, daring the killers to try again. Haunted by the memory of the woman he lost not once, but twice – first to the love of another man then to a tragic mistake which led to her death – Austin is a man shackled by the self-imposed rules he uses to protect his fragile heart. Is Callie the woman with enough love in her heart to shatter Austin’s rules and let him love again? I hope you love Angel in the Moonlight as much as I still do! Unexpected Eden Released, Giveaways, Party!